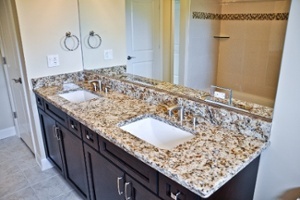 We proudly serve all areas in and around Chicagoland and have completed many bathroom and kitchen renovations in the area. Check out a few of our main cities and villages! Tucked away among the northwestern suburbs of Illinois, “The Exceptional Community” of Elk Grove Village is probably best known as the home to thriving industrial manufacturing enterprises, the Alexian Brothers Medical Center, and its namesake wildlife preserve. But one thing that can’t be overlooked is the abundance of wonderful homes and families in this community, which offer one of the highest standards of living in the Chicagoland area. 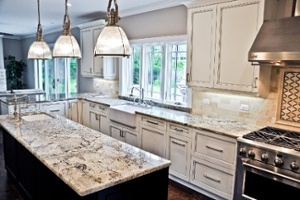 Granite Selection is proud to provide residents of Elk Grove Village with the best selection of premium granites for countertops in chicago from around the world to furnish and add value to these already incredible properties. Over the years, Evanston has had many names, from “Heavenstown” (a reference to the abundance of churches in the township) to “The City of Homes.” This later name is especially apt, highlighting the numerous prominent architects who have developed so many beautiful homes and mansions in Evanston, especially along the lakefront. But whether they live in a mansion, or one of the many lovely single family properties that grace their cobbled streets, residents of Evanston know they can count on one business to provide the best selection of premium granites from around the world: Granite Selection. Featured in notable movies such as Ferris Bueller’s Day Off, Risky Business, and the Home Alone series, and home to many Chicago celebrities including Michael Jordan and Keith Cozart, Highland Park is well-known as one the most desirable places to live in the Chicagoland area. The record high property values and beautiful homes both old and new are a clear testament to the exceptional standards of Highland Park residents. Granite Selection is the only fine stone purveyor that provides the selection of premium granite slabs to meet the tastes and expectations you can only find in Highland Park. Northbrook is probably most famous for its portrayal in John Hughes’ films as a quintessential, prosperous American suburb. This thriving community features some of the most profitable businesses, highly ranked public and private schools, and beautiful homes in the Chicagoland area. As a result, Northbrook is the chosen home of many notable figures including professional athletes, performers, and business owners, as well as a range of beautiful historic and modern homes. Granite Selection is proud to offer our premium granites from around the world to homeowners in Northbrook, who have the taste and means to select only the best granite countertops available. What can we say about Naperville that hasn’t been said already? Ranked as the second-best place to live in the United States by Money magazine, and the wealthiest city in the Midwest, Naperville is the choice destination for movers and shakers in the Chicagoland area. This thriving community also features some of the most highly ranked schools and prominent businesses in the country, alongside staggering mansions that would make any millionaire blush. Granite Selection is proud to be Naperville’s number one provider of luxury stone, owing to our unparalleled selection of premium granite from around the world and expert fabrication technicians.